Opening on February 27, 2019 at 12:00 p.m. (noon) eastern time, registration for Recon Ruck is $45. Patricipants receive a technical shirt and a commemorative bib. All finishers earn a finisher patch. Participants must supply their own pack and weights. Ruck, then Amuck. The Crossroads Challenge is a combination registration that includes both, the Recon Ruck and Run Amuck. An option to participate in Belleau Wood 8K and Run Amuck also exists. 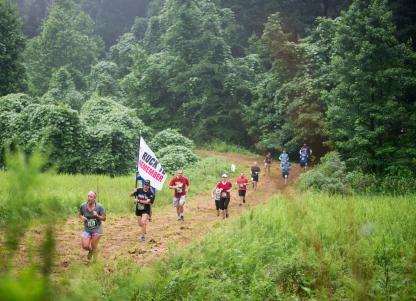 Participants will complete the 12 mile Recon Ruck before embarking on Run Amuck. All events start and finish at Butler Stadium in the heart of Quantico, known as the “Crossroads of the Corps.” Recon Ruck begins at 6 a.m. Participants must maintain an 18 minute-per-mile pace in order to begin the Run Amuck portion of the Challenge no later than when the final wave starts at 10 a.m.
Crossroads Challenge finishers will earn a special medal in addition to the Ruck patch and Run Amuck coin. While runners may register for both events separately, only those who sign up for the Crossroads Challenge are eligible for the special medal. 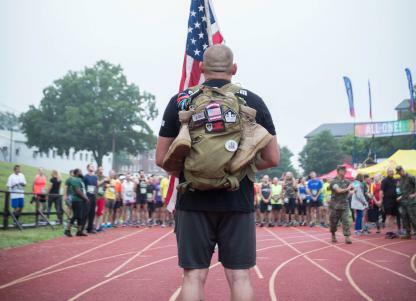 There is no option to participate in both, the Ruck and the 8K. Registration for the Crossroads Challenge costs $90 and offers participants a special technical shirt. After registering for the Recon Ruck some runners unfortunately are unable to participate. These runners may opt to transfer their entry to a non-registered runner through the Transfer Program. The MCM doesn't assist in the identification of individuals to receive a transfer. Runners often find transfer partners on the MCM Facebook page. Runner-to-Runner: Runners currently registered for the Recon Ruck have may transfer an entry to another runner. There is a $25 transfer fee (plus processing) associated with transferring between individuals. Either individual involved in the transfer may pay this fee. A wide variety of volunteer positions will be available offering numerous ways for individuals and groups to support event day. Currently, Recon Ruck volunteer registration is closed but exciting opportunities exist to support other MCM events.